Most German chemicals businesses show robust solvency and liquidity figures, however in 2016 sales decline as producer prices continue to decrease. The German chemicals industry (including pharmaceuticals) is the largest chemicals industry in Europe and the fourth largest in the world. Of the about 2,000 companies that produce chemical products, more than 90% are small and medium-sized enterprises (SMEs) with less than 500 staff members. SMEs employ one third of the workforce and account for almost one third of total chemicals industry sales. Unlike in other industries, chemicals SMEs are often customers, not suppliers of large chemicals companies. 2015 was a rather subdued year for the German chemicals industry due to the economic slowdown in many major emerging markets like China, while the economies of Brazil and Russia even contracted. As a supplier to almost all industrial sectors and highly export-oriented, the German chemicals sector was immediately affected by those events. At the same time, domestic demand for chemical products was subdued. After a good performance in H1 of 2015 chemicals businesses had to reduce their production in H2. According to the German chemicals association VCI, production excluding pharmaceuticals decreased 0.7% in 2015 (including pharmaceuticals: up 0.7%), while turnover decreased 0.4%, to EUR 190 billion. Producer prices decreased 2.8%, and with more sluggish sales, falling raw material prices had to be passed on to customers. The production of polymers (up 0.3%) and inorganic chemicals (up 0.7%) barely grew, while manufactures of consumer chemicals (down 3.4%) and petrochemicals (down 3.1%) recorded setbacks. In 2016, the VCI expects production to increase 1% and turnover to decline 1%, as producer prices continue to decrease. Domestic demand is expected to remain subdued due to modest industrial growth, while exports are expected to pick up. However, increased international competition forces chemicals businesses to immediately pass on lower commodity prices to customers. 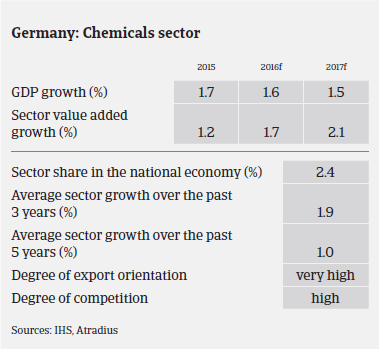 Despite the rather subdued performance since H2 of 2015, most German chemicals companies remain generally satisfied with their business situation. Given the persistently low oil price, most companies still do good business, even with decreasing sales. 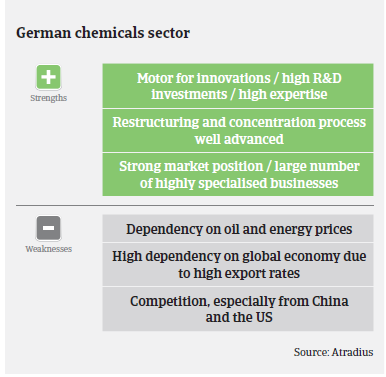 Generally, German chemicals and pharmaceuticals businesses have robust equity, solvency and liquidity. Profit margins are expected to remain stable. The German chemicals sector’s payment behaviour has always been better than average with no notable payment delays. In our experience payments take, on average, 45 days – even fewer for domestic payments, as most chemical products are exported to destinations with longer payment terms than the domestic market. We have seen no change in payment behaviour or increase in notifications of non-payment in the last six months and this trend is expected to continue in the coming months. 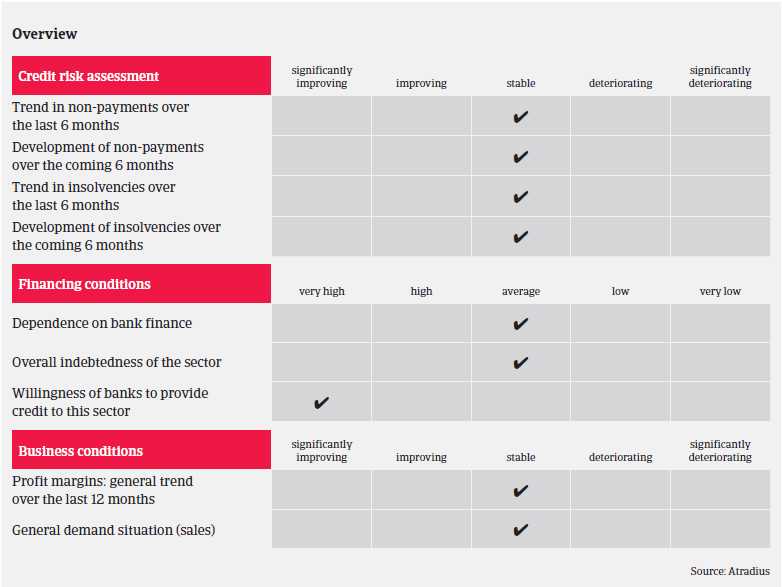 The insolvency environment is stable with insolvencies expected to remain at a low level. Our underwriting stance for this sector remains generally relaxed, with normal external monitoring and buyer reviews.